Oath Pizza prides itself on doing things differently from the typical fast-casual pizza restaurant. The Boston-based company, which makes a Neapolitan thin-crust-style pizza, takes a nontraditional approach to food preparation, according to CEO Patrik Hellstrand. “We are really a broader food company that is catering to people who love great food and also care about their decisions,” Hellstrand said. The company’s farm-to-table philosophy emphasizes sustainable and ethically sourced ingredients, and this is the first pizza chain to receive Humane Farm Animal Care certification for its food operations. Not only does Oath Pizza choose to work with farms that follow humane practices for the handling and raising of animals, but also its meats and cheeses contain no chemicals, hormones or antibiotics. “Honesty and transparency around our food is really important to us, and I think it defines us much more as a company than just pizza,” said Hellstrand. Oath Pizza co-founders Doug Ferriman and Max Seel opened their first restaurant in a 400-square-foot shack in Nantucket, Mass., in 2015. They were making the crust at night and selling the pizzas during the day. “After a really successful summer in Nantucket, where they essentially got no sleep, they started thinking about how they could make this at scale,” said Hellstrand. Oath Pizza has since opened seven restaurants and obtained a food truck, and the company is working toward having 20 restaurants open by the end of this year. Thus far the focus has been on Boston and on Cambridge, Mass., but the company is now beginning to expand further in the Northeast. Beyond the restaurant that opened last year at the Mosaic District, in Fairfax, Va., the company is looking to open units at the Washington, D.C., Navy Yard and in New York City by early next month. 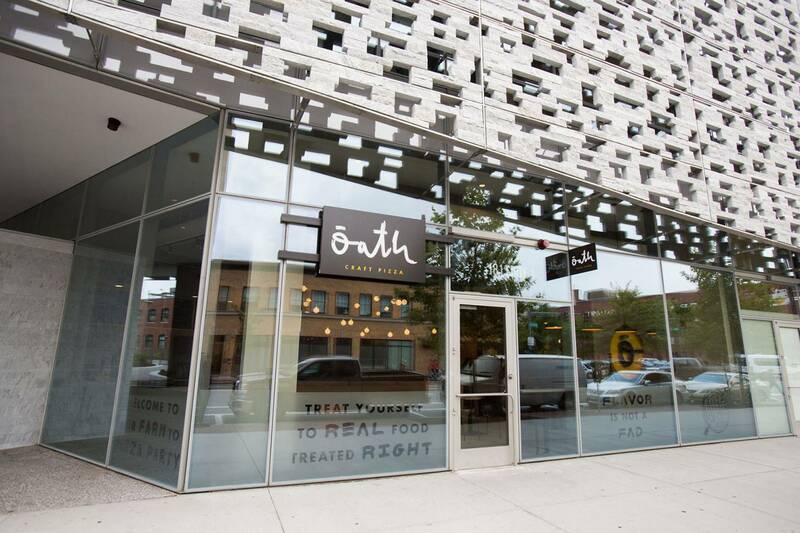 Oath Pizza is experimenting with restaurants of various sizes, ranging from a 165-square-foot kiosk at Boston’s South Station train terminal, to units that measure roughly 2,000 square feet and operate in shopping centers and on busy streets. Real estate inquiries may be directed to Greg Rainforth, director of real estate, at (207) 232-1348 or Greg@oathpizza.com.